Priorities are used to indicate the priority of an object and can be added, edited and removed in System settings ‣ Workflow ‣ Priorities. Go to System settings ‣ Workflow ‣ Priorities. Click Create to create a new type. 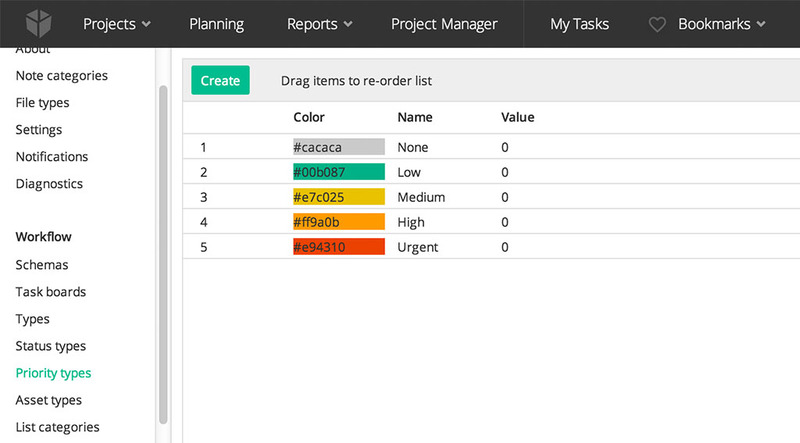 Select color to associate it with, enter a name and a value. Click the pen icon on a row corresponding to a specific type to edit it or the trash can icon to remove it. The items in the list can be dragged and dropped to change the order in which they appear in the drop downs. The first item will be the default type when creating new items in the spreadsheet.